All generator rotors are dynamically balanced to be better than BS6861: Part 1 Grade2.5 for minimum vibration in operation. Two bearing generators are balanced with a half key. Standard generators are 3-phase reconnectable with 12 ends brought out to the terminal box, which is mounted on a cover at the non-driver end of the generator. A sheet steel terminal box contains the AVR and provides ample space for the customer wiring and gland arrangements. It has removeble panels for easy access. All generators have two kinds construction. the single-bearing generators engine adaptor to SAE0, 1, 2, 3, 4 and 5, the coupling discs to SAE7, 5, 8, 10, 11, 5, 14 and 18 are available. 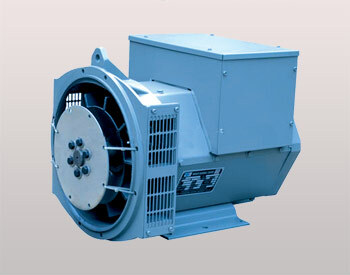 The Double-bearing generators adaptor to SAE0, 1, 2, 3, 4 and 5 are available.